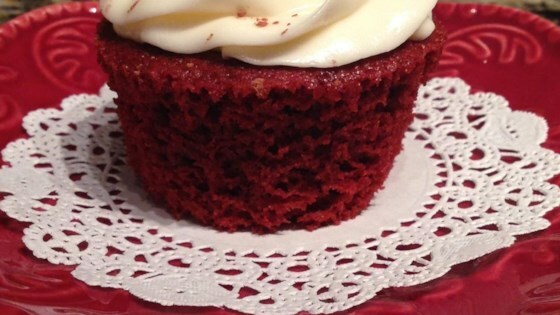 "This is the frosting I use on delicious red velvet cupcakes. Is this the easiest recipe I've ever done? Maybe!" Place butter, cream cheese, vanilla extract, and lemon juice into the work bowl of a large stand mixer fitted with whisk attachment; beat mixture on medium speed until smooth. Scrape down the attachment and sides of bowl; add confectioners' sugar to butter mixture. Mix at low speed until confectioners' sugar begins to incorporate into butter mixture. Raise mixer speed to high and beat until frosting is light and fluffy, scraping sides occasionally, about 3 minutes. Frosting will set up and become firmer when refrigerated. Start with 1 cup confectioners' sugar and add more to taste, up to 3 cups. Double recipe if you like a thicker layer of frosting. Very tasty and creamy frosting. I'd probably use half the sugar next time, or twice the cream cheese. As written I only got about a cup so double the recipe for a 9" round 2-layer cake. Not my favourite. I'm still looking for a good recipe. This comes out great and exactly like the video ones. I did everything accordingly. But personally i feel that it is a little too sweet for me. Can lesser the icing sugar to a cup. This is so delicious I can't say enough. I made this recipe with the lemon juice the first time and the second time I used fresh juice from an orange. It is so good. I followed exactly the recipe and its the yummiest cream cheese frosting ! Chef John gives the best recipes!